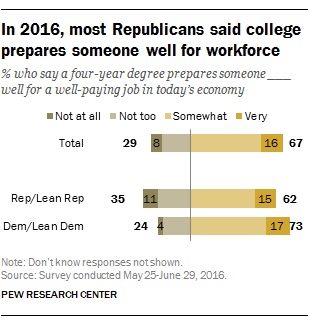 In addition, most Republican college graduates – like their Democratic counterparts – said their own college experience was valuable for developing skills for the workplace. The change in Republicans’ views of the effect colleges and universities have on the country is striking. Currently, 58% of Republicans and Republican-leaning independents say colleges and universities have a negative effect on the way things are going in the country, while just 36% say their effect is positive, according to a survey conducted last month by Pew Research Center. 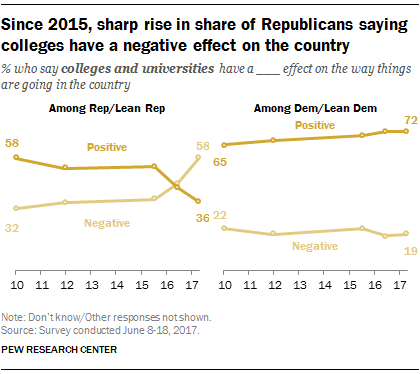 Just two years ago, attitudes were the reverse: a 54% majority of Republicans and Republican leaners said colleges were having a positive effect, while 37% said their effect was negative. The decline in positive assessments of post-secondary institutions has come among Republicans who have college degrees and those who do not. By comparison, a wide majority of Democrats (currently 72%), including large majorities of college graduates and non-college graduates, continue to view colleges and universities as having a positive effect on the nation. There are more modest partisan divisions on other survey questions about the impact of higher education. In a study last year of attitudes about the state of American jobs, majorities in both parties – regardless of their level of educational attainment – said a four-year degree prepares someone very or somewhat well for a well-paying job in today’s economy. However, Democrats and Democratic leaners were more likely than Republicans and Republican leaners to say this (73% vs. 62%). Wide majorities of four-year college graduates – both Democrats and Republicans – also said their own college education was useful in helping them develop specific skills and knowledge that could be used in the workplace, in opening doors to job opportunities and in personal and intellectual growth. And there was no partisan gap in the shares saying their education was useful in opening doors to job opportunities: 88% of Republicans and Republican leaners with at least a bachelor’s degree said this, compared with a similar share of Democrats and Democratic leaners (86%). While Republicans and Democrats broadly agreed on the impact of a college education for their skills, opportunities and growth, there was a substantial difference in how they viewed the main purpose of college overall. In both parties, those with a bachelor’s degree or more education were more likely than others in their own party to say that college’s primary role is personal growth. But the partisan gap on this question was about as wide among Republican and Democratic college graduates as among those with less education.